Ethiopic Grammar. Second Edition enlarged and improved (1899) by Carl Bezold. Translated by James A Crichton. A very nice bright, crisp copy in original maroon cloth, spine lettered gilt. 5 folding tables bound-in back as called for. London college bookplate to paste-down, with three other neat stamps. No other signs of use. An excellent copy of this standard work. 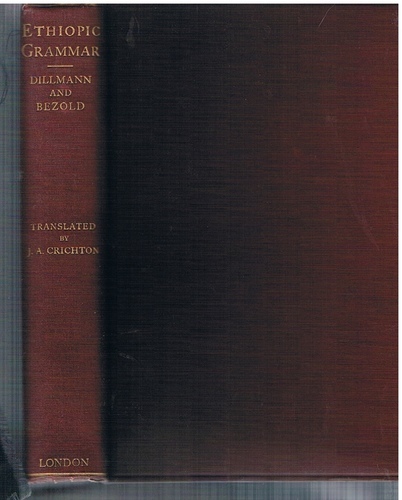 ; Dillmann was a German biblical scholar who devoted himself to the study of Ethiopic. His first Ethiopic Grammar appeared in 1857 and his Lexicon Linguae Aethiopicae in 1865. He also worked on publishing an Ethiopic Bible.